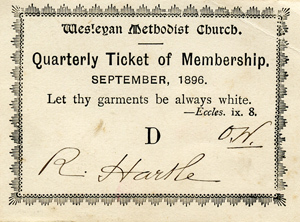 This is a quarterly Membership Certificate given to each member of the church. It was usually handed over by the Minister of the church during a home visit. The regular payment seemed to be rather like an unofficial tithe. Thank you to Mark, Madeline and Mavis for comment on this item.